Luke Knighton attempted to strangle his girlfriend in the parking lot of a bank. 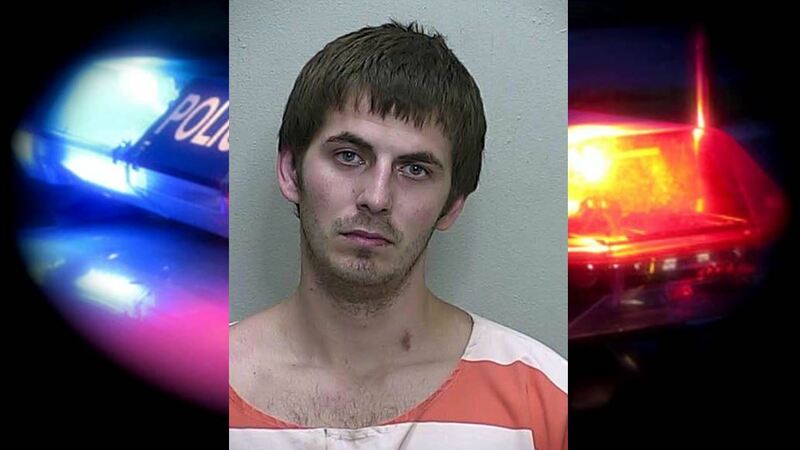 Dunnellon, Florida — A man has been charged with five felonies and a misdemeanor, following a confrontation with his girlfriend in the parking lot of a bank. Dunnellon Police Officers responded to Cadence Bank, located at 11932 North Williams Street, after receiving a call in reference to a man beating on a woman. Bank employees told deputies that Luke C. Knighton, 21, was “extremely intoxicated” and that he had spat into his girlfriend’s face. Witnesses stated that after Knighton spat in the victim’s face, he attacked her by repeatedly striking her. According to reports, Knighton also grabbed the victim by the throat and began to choke her to the point that she could not breathe. Police said that two good Samaritans, Summer Halliwell and her boyfriend Derrick S. Dietly, intervened and forced Knighton to release his grip from the victim’s throat. Bank employees then separated all parties involved. According to witnesses, after Knighton was separated from the victim, Knighton threatened, “If you press charges I will beat you unrecognizable.” He then retrieved the cell phone of the victim and witnesses and attempted to smash them on the pavement so they could not call 911. Officials reported that the victim had multiple cuts, scrapes, and bruises on her arms, face, neck, and back. The victim also had visible fingerprint marks around her throat. According to reports, as Knighton was handcuffed he “shot a bird” at the victim and stated “f**k you” in a threatening manner. Police said it was evident that the victim was terrified of Knighton. Knighton was charged with Domestic Battery by Strangulation, Disorderly Public Intoxication, and Obstruction of Justice-Witness Tampering (x3). He is currently being held at the Marion County Jail. His bond has not been set pending an arraignment.